Hey Mystic, Dream A Little Dream With This Very Neptunian New Moon! The New Moon In Pisces occurs Wednesday 6th March 2019, 4.04 pm GMT at 15º47′. Sydney, Thursday March 7th 3.04 am. What to do With This New Moon? A potent time of collected energy, the energy now culminates in the Pisces zodiac sign. Sun, Moon, Neptune and a hazy Mercury Retrograde are gathered together in this, the ‘mutable‘ water sign, which I like to liken to a rapid, rushing river or waterfall – refreshing, fluid and free. At this new moon, moon and sun are syncing with Saturn and Mars in earth signs Capricorn and Taurus, bringing a steadiness, practicality and reliability to what’s in focus; the backdrop to our flowing emotional sensitivity is loaded with stability and steadfast endurance! However, the new moon re-sets in close conjunction with misty blue Neptune (sun and moon are at 15º Neptune at 16º). Mercury is at the last degree of Pisces, now retrograde, increasing confusion and sense of vagueness at this lunation. It’s extra important to go within, heighten intuition, to take time, and to allow thoughts and feelings to wash over, leaving their impression of what’s in view and in mind. Just before the new moon we can let go and release, ready to make room for a brand new cycle and fresh start. This is an excellent time for manifestation, thinking about what’s to come… Things you contemplate now could come about and into fruition in the months ahead! Perhaps you don’t even have to wish for the most wonderful things to unfold, they’ll just happen naturally, although it’s always fun (and more intentional) to write down exactly what you’d like to occur before handing it to the universe with a smile. 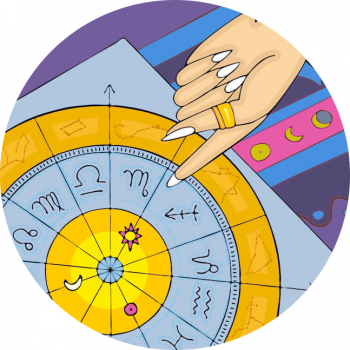 Read your horoscope for a hint at how this will play out, across both sun and rising sign. Indulge the feet during the Pisces season; the new moon marks a wonderful time for detox – exfoliation, a foot scrub and pedicure! That’s because it’s time to Let Go, releasing tension (and dead skin) through the tootsies. Embrace aromatherapy and reflexology now, for extra relaxation during this heightened time. Use relaxing lavender essential oils, plus sandalwood, frankincense and clary sage. It’s not just the full moon that disturbs our sleep pattern. The new moon has the potential to knock us off our feet so get an early night and your beauty sleep! Pisces is the sign of escape and going off the grid, and often Pisces rising and Pisces people rock sleepwear as a fabulous red carpet affair – read more in Pisces Pyjama Party! Pisces is in tune with the collective consciousness – the everything– and will often tune into to yoga, meditation and other spiritual practices that allow them a closer connection to universal power. The new moon in Pisces is a fabulous time to get into a Vinyasa pose and tune our of ego and worldly concerns. Avoid escapism through drugs and alcohol, and all that’s glamorous or fantasy fuelled – that’s not going to give you the heightened awareness you crave now! It’s a new moon so refresh your mane of locks with a double-wash at the salon! Pisces is the original mermaid of the zodiac and has naturally gorgeous thick hair. This is a fertile sign and so could be a nice time to consider a cut – especially with Mercury and Venus together in Aries, the sign that rules the head. This lunar phase is best used for closure, transition and release, with the promise of fresh starts and new beginnings. If you are going to change your style really think about it and harness the stars in your communications!